Purpose: Improve remnant connectivity and create a vegetation buffer to protect wheat crops. For this project, a number of blocks and wide corridors were revegetated, providing buffers from adjacent roads and restoring a degraded road reserve running through the property. Planting was also used to help control an area of invasive Spiny Rush infestation. 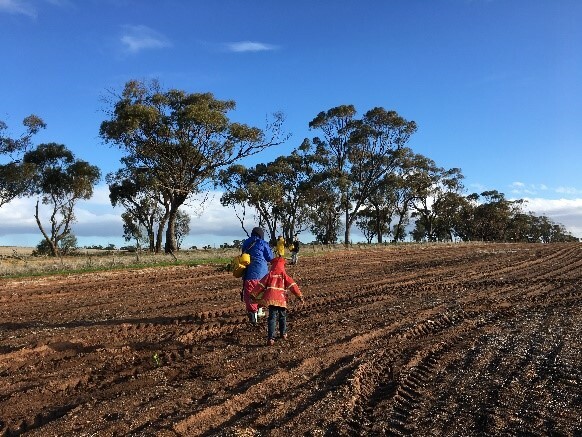 Over 24,000 locally native seedlings were hand-planted in the first year, and 18,000 the next, with additional direct-seeding in some patches. Two years on, early plantings are well-established and there has been remarkable growth in some areas, forming dense shrub lines and habitat. KEY LEARNING POINT: During initial site preparation for planting, different weed control methods were applied to different zones. The resulting weed levels were used to inform and adapt subsequent weed control and site preparation, improving the overall success of the revegetation. KEY ENVIRONMENTAL ACHIEVEMENT: More than 11 km of native vegetation corridor was created, helping link significant bush remnants with nature reserve along the Avon River. To learn more about this project watch the video.